In 2003 me and a few friends sat down at Nova cinemas in Lygon St. (Melbourne, Australia) to watch the first “Yes Men” movie. The yes men are a group of activists who participate in something called “identity correction”. They basically host websites which are similar to, and make fun of, the websites of entities such as the World Trade Organization, Exxon Mobil, and Dow Chemical. Every now and then, someone will stumble on one of these fake websites and invite the Yes Men to a conference. The Yes Men will attend and proceed to make a complete mockery of the organizations that they supposedly represent. The curious thing about this, is that they are often not even spotted as fakes, despite the extraordinary outlandishness of some of their pranks. Naturally, on exiting the cinemas, my first words were “we HAVE to do that!”. Sadly, there was the small matter of having to complete a university degree that got in the way of that. Fast forward nine years and a lot has happened (this website is evidence enough of that). Just recently, the Yes Men released another movie, so naturally I had to go and see it. Like the previous film, “The Yes Men Fix The World” takes the form of a documentary, going behind the scenes of the buildup and aftermath of some of their pranks. The main difference I noticed was the pranks had become “better”. They were certainly bolder, more far-reaching, and more polished in their execution. As before, they were rarely caught in the act, or even suspected. The first featured prank was one that I was already quite familiar with. I spent some time while I was living in the U.S. involved with students for Bhopal, an organization which works for the “fixing” of the mess that was left after the Bhopal disaster of 1983. For those unfamiliar with this prank, I encourage you to watch the YouTube video of it during which one of the Yes Men, posing as a spokesperson for Dow Chemical, goes live on BBC to announce that Dow will finally clean up its mess. The backlash from this prank was not entirely positive. 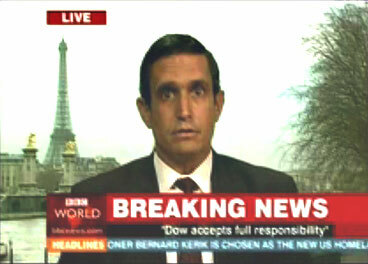 Within 20 minutes Dow Chemical contacted BBC and corrected the prank and the BBC had to apologize. In that time, Dow’s stock fell in value by a staggering 2 billion dollars. Interestingly, there was also a backlash from those who ordinarily support the plight of the Bhopalis saying that the prank was cruel because it raised false hopes. While I find this a ridiculous assertion, I can see why someone might think that. I do, however, find it ironic that someone who objects to someone being a fake spokesperson for Dow and misrepresenting Dow’s position on Bhopal, could in the same breath presume to represent the position of a Bhopali. To their credit, the Yes Men decide to investigate this by doing the obvious thing which is to visit Bhopal and ask the Bhopalis what they thought of the prank. Unsurprisingly, the Bhopalis seemed quite supportive of what the Yes Men did. Here are a group of people who have suffered for over 20 years because of a terrible industrial disaster, and who have basically been ignored by all the people who are supposed to help fix the mess. Now someone pulls a prank which is seen live by over 300,000 people and over the next few days by goodness knows how many, moreover, this prank educates viewers about the fact that the mess still remains. Even if the “good news” turned out to be false, the publicity alone is a huge victory. The film continues in this vein through more presentations and pranks. Their love for puns and wordplay is appreciated by corporate types as well as myself and their props, as usual, are hilarious in their absurdity. Again and again, the viewer is astonished at just how outlandish the suggestions and presentations can get without any of the attendees at these conferences bat an eyelid. (ok, that’s not quite true, when they lit “vivoleum” candles that smelled of human flesh, a few people got suspicious). The film suffers many of the problems that plague films of this type in that there is a lack of a strong plot to steer the direction of the film. It wanders from episode to episode often without a particularly strong segue. There are, however, strong themes which recur time and time again. The Yes Men are often accused of lying, to which they retort with an argument along the lines of – “but it isn’t a lie, it’s the truth, it is reality that is being dishonest here”. And that is, in my view, the central thrust of the film – that the reality that we have come to accept is dishonest, and one of the most effective ways of making this point is to present an alternative reality – one which may be a “lie” under certain definitions, but is simply a demonstration of what the world could be. During a retelling of the episode where they handed out fake copies of the New York Times, I couldn’t help but think of Fidel Castro’s famous line “A better world is possible”. Despite the disjointed nature of the film, I couldn’t help but smile my way through it. It is so refreshing to see a movie about “real life” which is actually optimistic in tone. The pranks are inspirational, and those of you who are sick of the corporate spin and doublespeak will enjoy the refreshing “truth” that the Yes Men’s culture jamming will bring.